(NewsUSA) - As the high school and college football seasons heat up, the National Operating Committee on Standards for Athletic Equipment (NOCSAE) is encouraging parents, coaches and athletes to refresh their knowledge on helmet safety and safe play. 1. Know Your Helmet There are no concussion-proof helmets. No football helmet completely prevents all head injuries, including concussions. 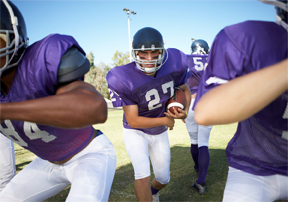 A concussion is a complex event that involves a variety of factors. Advertising or other media claims that a particular helmet is anti-concussion or concussion-proof are not supported by research and can be misleading and dangerous. Avoid relying on any single data point, rating or measurement when considering helmet options. Proper fit is critical. Helmets are designed for safety and performance based on proper fit, specifically contact with the head. Ask your athlete how the helmet feels -- helmets should not be too tight or too loose. Find fitting and wearing instructions through the CDC Foundation at www.cdcfoundation.org/HeadsUp. Look for the logo on the back of the helmet that reads, "Meets NOCSAE Standard." The NOCSAE logo signifies that a helmet model has passed the most rigorous, science-based performance standards in the world. Do not alter or change your football helmet. Adding accessories and removing padding can alter how the helmet was intended to function and potentially interfere with its performance. 2. Maintain Your HelmetHelmets should be reconditioned and recertified to the NOCSAE standard on a regular basis. Helmets that have been recertified will have a label inside the helmet indicating the name of the recertifying company and the date of recertification. If you have doubts, ask your coach or school administrator about their policy for reconditioning and recertification. Replace the helmet after 10 years. 3. Prioritize Safe Play Football helmets are just one part of helping to protect against head injuries. Use proper blocking and tackling techniques and demand enforcement of rules that prohibit players from leading with their helmets to hit other players. Know the signs and symptoms of concussions -- which can include headache, nausea, confusion, dizziness and memory difficulties -- and encourage everyone to report any and all symptoms. If a concussion has been diagnosed, athletes should not return to play until cleared by medically trained experts following return-to-play guidelines. Remember: if in doubt, sit it out. For more information visit www.NOCSAE.org.